It has been 25 years since TVS launched the Scooty nameplate in the country. 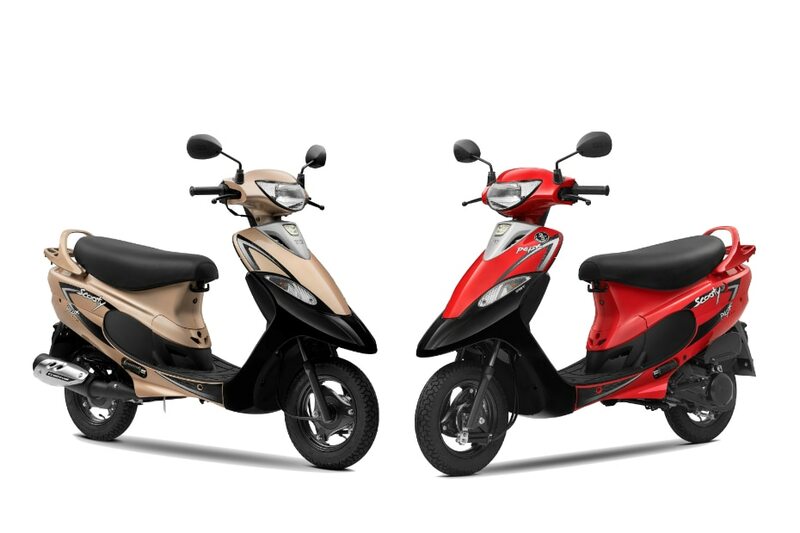 Two new colours for Scooty Pep+: Revving Red and Glittering Gold. Sooty Pep+ also gets a 25th anniversary edition logo and new graphics. TVS currently has two scooters under the Scooty brand: Scooty Pep+ and Scooty Zest 110. TVS has tasted quite a bit of success with the Scooty brand. The diminutive scooter was a hit with the ladies thanks to its low seat height and weight, which made it quite easy to ride. The formula hasn't changed much with the current Scooty Pep+ and Scooty Zest 110, and It has been 25 years since the first Scooty was launched. To celebrate the occasion, TVS has introduced two new colours for the entry-level Scooty Pep+. The new Revving Red and Glittering Gold colours add to the five existing colours options. The Pep+ also gets a ‘25th Anniversary’ logos and new graphics. Other than these additions, the rest of the scooter remains unchanged. That includes its price tag of Rs 42,397 (ex-showroom, Delhi). At this price, the Scooty Pep+ is the most affordable scooter you can buy in the country. Hosur, April 11, 2019: TVS Motor Company, a reputed manufacturer of two-wheelers and three-wheelers, today celebrated 25 years of its iconic brand TVS Scooty, with introduction of two new colours – Revving Red and Glittering Gold for TVS Scooty Pep+. Most women drivers on the road today, not limited to two-wheelers, had their first taste of independence astride the TVS Scooty. To ensure this phenomenon of personal mobility spread far and wide, TVS Scooty, initiated “Women on Wheels” - India’s first two-wheeler Rider Training Institute for women. Over the years, this journey of staying relevant has also been backed by multiple innovations from TVS Scooty like the introduction of India’s first mass customisation program “99 colours”, or celebratory special series like the Wimbledon edition. TVS Scooty has also earned its place in the record books with TVS Zest 110 becoming the first 110cc scooter to scale the highest motorable road in the world, Khardung La, (India Book of Records) leading to one of the most loved social media and experiential campaign – Himalayan Highs. Over the last three years, this campaign has further built on the popular brand franchise while creating brand advocates. Commenting on this occasion, Mr. Aniruddha Haldar, Vice President (Marketing) – Commuter Motorcycles, Scooters & Corporate Brand, TVS Motor Company, said, " TVS Scooty Pep+, is much more than just India's No. 1 economical scooter catering to over 4.5 million customers. In its journey of 25 years, it has always evolved to stay relevant to its purpose of being the most viable mobility option for the New Age Indian women, making their commute affordable, comfortable, safe and fun. A TVS Scooty is passed down in the family and seldom resold, this is a measure of love that the brand has enjoyed. We are humbled and grateful to the generations of proud TVS Scooty owners, who built this brand to its iconic status, and made it synonymous with female mobility in India." TVS Scooty PEP+ Powered by an 87.8 cc, air-cooled single cylinder Ecothrust engine that develops 4.9 PS of power and 5.8 Nm of torque, the Ecothrust engine ensures long-lasting, trouble-free and comfortable rides to consumers. With best-in-class ground reachability and a telescopic suspension that makes bumpy rides comfortable, TVS Scooty Pep+ promises an ultimate peppy comfort ride. TVS Scooty Pep+ is equipped with smart features like mobile charger socket, side stand alarm, under-seat storage hooks, DRLs, an open glove box and TVS's patented ‘Eazy’ Stand technology, which reduces the effort to put the vehicle on the centre stand by 30%. TVS Zest 110 is powered by a single cylinder, four-stroke, air-cooled 109.7cc CVTI engine and a top-notch overall ride handling. Targeted at the New-age Indian Woman of today, the TVS Zest 110 stands true to the DNA of a scooter, while maintaining a fun look, coupled with vibrant colours, elegant design and a remarkable initial pick up of 0 - 60 kmph in mere 11.1 seconds. TVS Zest 110 holds the record for being the first scooter to reach the highest motorable road at Khardung La.